'Game Of Thrones' has become one of the hottest properties on worldwide television over the last few years, and to celebrate the forthcoming new series, we're lucky enough to be giving away a set of 'Game Of Thrones' mugs. We're reliably informed that there's not many of these sets available right now, so that's an added incentive. We had the fortune of popping along to the London premiere of the first episode of season three earlier this week, and a report on that is forthcoming. 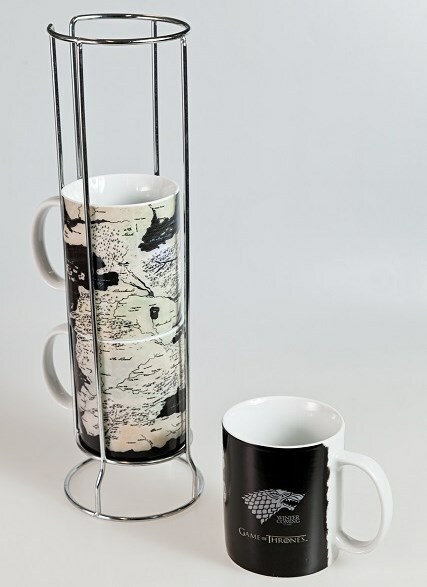 In the meantime, here's your chance to win a set of three 'Game Of Thrones' mugs, that you can see in all their glory below. If entering via Twitter, please tweet the following message - I'd like a Game Of Thrones mugset please @glamourfaded #GoTSkyAtlantic #GameOfThrones. If entering via Facebook, please go to the 'Game Of Thrones' competition post photo and simply add a comment with the title of your favourite episode. 'Game Of Thrones' returns to Sky Atlantic HD from Monday 1 April at 9pm. Seasons 1 and 2 will also be available On Demand.